Can You Survive the Distance on PS4? Hi there! My name is Jordan Hemenway and I’m one of the developers at Refract, a Seattle-based indie studio. I’m excited to finally unveil that we’re bringing our survival racer Distance to PS4 in 2015, and you’ll be able to play it at PlayStation Experience this weekend! Distance is what we’re calling a survival racing game. It takes the intense action of arcade racing and places it in an explorable, atmospheric world. The environments are mysterious and deadly with treacherous obstacles around every corner. Instead of doing laps on a loop, you’ll be trying to survive from point A to point B.
Fortunately you control a unique car that allows you to boost, jump, rotate, and even fly. Instead of being constrained to the track, you can break away at any point and find your own path. You can even drive upside down or on buildings and walls parkour-style if you like. Multiplayer takes this to the next level. To overtake your opponents you’ll have to use all of the car’s abilities at your disposal. For example, in Sprint mode it’s a quick dash to the finish with the goal being the fastest time. As you boost, your car’s core systems will begin to overheat, so to maintain the fastest speed you’ll have to land tricks (like backflips or barrel rolls) to stay cool. In Reverse Tag mode you want to remain “it” for as long as possible. As other players start closing in you might want to scale a building for a quick escape, or dive bomb from a high point to use gravity to your advantage. Using car rotation to transition out of flight might be the best way to keep your momentum and stay in the lead. The world has a mysterious history, and as you explore you’ll be able to uncover pieces of its past. Adventure mode takes you through a short story where you incrementally earn each of the car’s abilities and use them to survive the increasingly deadly environment. Crafting a story within a racing game has been one of the most enjoyable parts of the development so far. Without spoiling too much, we’re incredibly excited to have you discover the dark mysteries of this world. All of us at Refract hope to see you at PlayStation Experience! For more info about our ongoing development and to sign up for our newsletter simply visit Distance’s website here. If you have any questions let us know in the comments below! Looks awesome. Kind of like Wipeout but with more modes. 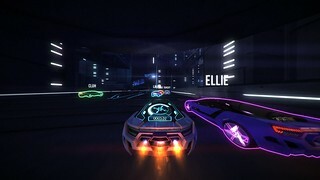 Looks cool, you guys should make a new wipeout, try to get sony to do it with you guys. This game looks cool! I’m interested. The gif helped! That trailer was sick. #Hype! Holy flying car flips, this looks walnuts. Any 3D? That would be insane. I helped back this game on Kickstarter, AWESOME news! This looks oddly familiar… was this at GDC or a University game originally? Yep! Distance is a spiritual successor to a student game we developed at DigiPen Institute of Technology called Nitronic Rush. This game has potential. Don’t mess it up! The video only showed 2 player split screen, but is 4 player local a possibility? 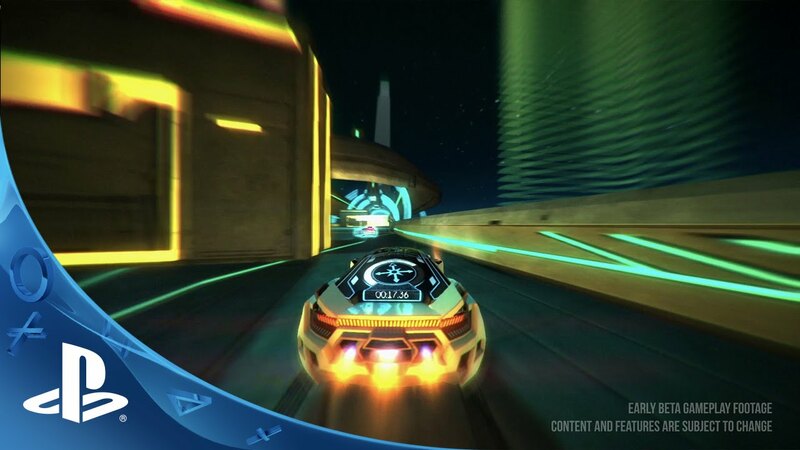 Looks like Rumble Racing in the world of Tron. Looks good. Would be a good title for the Vita. This game has all the best parts of Rush 2049 and goes the extra mile with them. I am super hyped. Cant wait. Looks good ! I, particularly, love that little “on-purpose-bugs” in futuristic games like these. Looking forwart to it ! Any chance of being on PS+ ? Are you the same person who made Nitronic Rush! We did! It was a student game we developed while attending DigiPen a few years back. We had way too much fun working on that project so we decided to create Distance as a re-imagined spiritual successor. wow. this game looks fantastic! 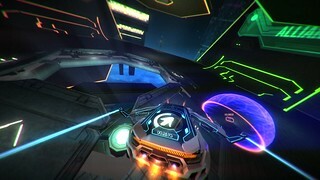 need a futuristic race to fill my wipeout void. very interesting concept, will definitely keep an eye on this one! Looks good. Would like to see more. Please work on the sense of speed tho. Yep this definitely is Nitronic Rush but with more features. Can’t wait to play it! This game looks amazing! super excited! Very very interested in this, I do love a game thats different, just hope sony allow us to save music to the hdd as I can’t copy music to usb as there is cd rights. Fantastic! Nitronic Rush is one of the most fun games I’ve played ever. I actually tweeted you guys and Sony months and months back to try and make sure this came out on PS4. Any chance of it coming to Vita as well? Or Maybe the original Nitronic Rush? This looks and sounds amazing, and you guys certainly did a great job on the trailer. I’ll definitely be keeping my eye on this one. Guess this as close to a Rollcage reboot as i’m gonna get. Looks like the Hotwheels game i’ve always wanted! Holy crap this looks good! I really hope you guys are able to release this with the current “no HUD” look from the trailers. I love the innovative ways you’ve put the info needed into the cars and have always hated the clutter on screen if it can be avoided. Sounds really cool. Can’t wait to play it. The game looks absolutely fantastic! It would be nice if there was some vehicle interaction between competitors though. From what I have seen it looks as if the vehicles just pass through each other.